You want your smile to get noticed, not your braces. MTM No•Trace System is the all-but-invisible orthodontic treatment to comfortably correct your smile in as little as 12 to 24 weeks. MTM No•Trace System uses low-profile brackets that rest on the back side of the teeth to achieve minor tooth movement. Say goodbye to the discomfort of traditional braces and say hello to MTM No•Trace, the brace without a trace. You want your smile to get noticed, not your braces. MTM No•Trace braces let you smile with confidence knowing that your treatment is taking place behind the scenes. If you're looking for an out-of-sight treatment that delivers out-of-sight results, MTM No•Trace System is for you — the brace without a trace. If you're considering orthodontic treatment to beautify your smile, but are concerned about your personal comfort, you're not alone. In a recent consumer study*, 80% of the respondents listed “comfort” as their number-one concern. MTM No•Trace System uses smooth, low-profile brackets engineered to fit naturally onto the back of your teeth, gently guiding them into correct alignment in as little as 12 to 24 weeks. *Quantitative research study of 1,042 respondents. It's likely you've already heard about many of the well-known personalities who have had their teeth straightened by braces that are affixed to the back of their teeth. But did you know that your orthodontist can offer you MTM No•Trace orthodontic treatment for a fraction of the cost of many full-mouth traditional wire braces? And did you know that MTM No•Trace braces are covered by many dental insurance plans? 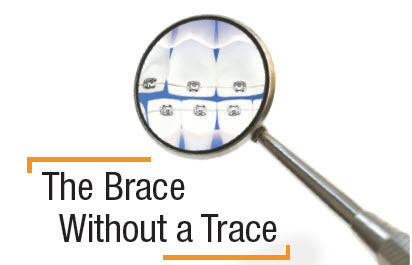 Learn all about the cost-saving advantages of MTM No•Trace braces by visiting our easy-to-understand insurance guide at www.MinorToothMovement.com.